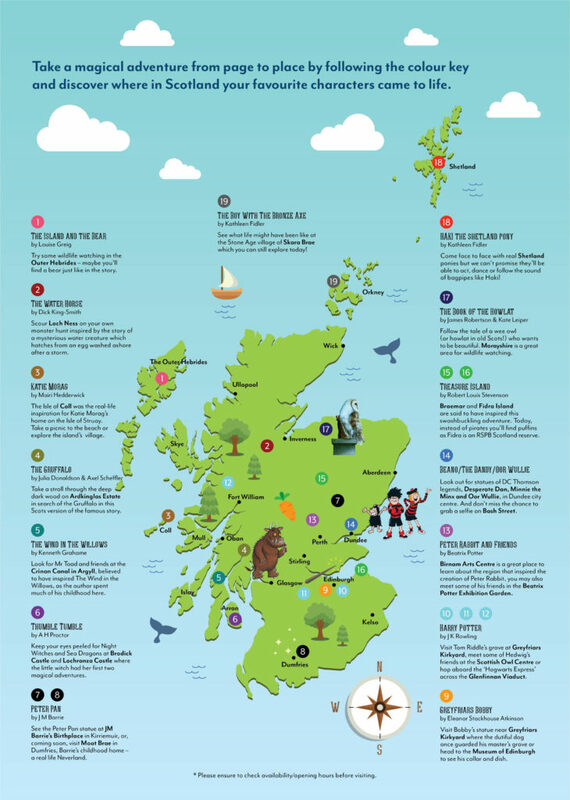 Scotland’s Storybook Trail includes a collection of characters and stories with connections to Scotland either by author, by location or by experience. The self-led trail will comprise of a map which will be available online and in print from select VisitScotland iCentres and literary outlets. Book lovers of all ages can embark on a literary adventure inspired by their favourite storybook characters and discover new stories to enjoy. Characters include Harry Potter, Peter Pan, The Gruffalo, Thumble Tumble, Peter Rabbit, The Howlat and Greyfriars Bobby. ‘Scotland’s Storybook Trail’ by Visit Scotland alights at The Beatrix Potter Exhibition & Garden at Birnam Arts, Perthshire. Whether it’s history, landscapes, wildlife or even architecture, for decades authors have used some of the country’s greatest assets to create characters that continue to delight readers of all ages. The trail, which comprises of a colourful map hosted on visitscotland.com and will be available at selected VisitScotland iCentres , as well as bookshops and libraries across Scotland, will help bookworms embark on their own adventures across the country, learning more about their favourite stories and discovering new tales inspired by or written in Scotland. Featured locations include the birthplace of Peter Pan creator, JM Barrie in Kirriemuir, Angus; the Isle of Coll, the inspiration of Katie Morag’s fictional home on the Isle of Struay; the Scottish Owl Centre in West Lothianwhere readers can meet some feathered friends, similar to those that feature in the Harry Potter series; and Birnam Artsin Perthshire, the region that inspired Beatrix Potter’s famous creations. And it’s not just the book locations themselves that will appeal to young readers – the trail includes some great bookshops and festivals to discover around Scotland. Jenni Steele, Film and Creative Industries Manager at VisitScotland, said:“Scotland has world-class literary links. Our landscapes, history and people have inspired writers for centuries, helping to bring to life enduring characters that capture the imaginations of not just youngsters but grown-ups too. Grab your wands and prepare for a magic adventure! Visit Tom Riddle’s grave at Greyfriars Kirkyard, meet some of Hedwig’s feathered friends at the Scottish Owl Centreor join a tour of the Capital to find out how Edinburgh’s buildings and people inspired JK Rowling’s smash-hit series about a boy wizard. Film fans -make sure to hop aboard the ‘Hogwarts Express’ across the Glenfinnan Viaduct. Robert Louis Stevenson’s swashbuckling adventure was written during a stay inBraemar. It’s thought Stevenson based some of the characters on people he met in the village. Treasure Island is also rumoured to have been inspired by Fidra Islandin East Lothian which the writer used to watch from the area known now as Yellowcraig. Today, rather than pirates you are more likely to find puffins as the island is an RSPB Scotland reserve. Make sure to pack your pixie dust as you head off on an awfully big adventure in search of Peter Pan. A statue of ‘The Boy Who Never Grew Up’ can be found at JM Barrie’s Birthplacein Kirriemuir, Angus but it was Moat Braein Dumfries, where Barrie lived as a boy, that inspired Neverland, the enchantedfaraway place where Peter Pan and the Lost Boys outwit Captain Hook. The antics of Dennis and his pals in Beano, and A’body’s favourite wee laddie, Oor Wullie have been published every week for decades by DC Thomson who are based in Dundee with Beano recently celebrating its 80thbirthday. Look out for statues of fellow DC Thomson legends, Desperate Dan, Minnie the Minxas well asOor Wullie, in Dundee city centre. And don’t miss the chance to grab a selfie on Bash Street. The Isle of Collin the Inner Hebrides was the real-life inspiration for Katie Morag’s home on the Isle of Struay. Take a picnic to the beach, explore the island’sonly real village, Arinagour, and keep an eye out for the whitewashed cottages that look just like the illustrations in Mairi Hedderwick’s books. Beatrix Potter created her most famous fluffy friend, Peter Rabbit, following childhood summer holidays in Dunkeld, watching and drawing wildlife.Birnam Artsis a great place to learn about the region that inspired her, you may also meet some of her other characters in the Beatrix Potter Exhibition Garden. Take a stroll through the deep dark wood on Ardkinglas Estatein search of the Gruffalo. Look out for the Mouse who’ll help guide you along the trail which tells the story, translated into Scots, of Julia Donaldson and Axel Scheffler’s famous, loveable beast. The Isle of Arranis the extraordinary little home of this extraordinary little witch. Visit Brodick Castleand Lochranza Castlewhere Thumble Tumble’s first two magical adventures were set. Keep your eyes peeled for Night Witches, Sea Dragons and Flower Nymphs – you never know what magic you might encounter on this spectacular island. Celebrating its 20thanniversary, the annual award-winning festival takes place in Wigtown, Scotland’s National Book Town. 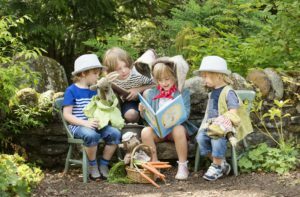 For ten days in September, the town buzzes with book events as well as theatre, music and a dedicated Children’s Garden offers activities to appeal to younger readers. The hugely popular Baillie Gifford Borders Book Festival, which in 2018 attracted record audiences, is always a highlight of the literary calendar and regularly welcomes some of the most well-known writers in the country. The Family Book Festival offers a wonderful selection of events with sessions from some of the best-loved authors for children, as well as free activities. 6 year old Charlotte Brady from Invergowrie and Carter (aged 6), Angus (aged 4) and Finn McKay (aged 2) from Dundee take inspiration from Scotland’s Storybook Trail to learn more about Peter Rabbit at the Beatrix Potter Exhibition & Garden at Birnam Arts, Perthshire. The Peter Pan Moat Brae Trust is recruiting for TWO roles in the senior management team that will bring alive the new Centre for Children’s Literature and Storytelling at Moat Brae, Dumfries. The Centre Director will have the imagination, drive and ambition to make it a key attraction for local people and national and international visitors alike, ensuring its future sustainability. The successful candidate will initially support the transition from the current project phase to the opening of the new Centre at the end of 2018 and ultimately lead the day-to-day and longer-term operations of an international visitor attraction. This is a challenging but nationally significant post. The successful candidate will be someone who is adaptable, resilient and able to manage complexity but also brave, determined and able to make decisions in consultation with others. S/he will be level headed in difficult situations, have a creative approach to problem solving and be enthusiastic and motivating. This is a chance to be in at the beginning of a new chapter of the story of this magical house and garden, in a position to write a happy ending. The closing deadline for applications is 12 noon, Wednesday 15 August 2018. Please see visit the Trust’s website at www.peterpanmoatbrae.org for more information, including the Job Description and Person Specification for the post. To apply please submit your CV and a covering letter saying how you meet the job requirements for the post to: Iain Wilson, Trust Administrator, at iain@peterpanmoatbrae.org (email or phone 01387 255549 if you have any questions or to discuss the post further). The Visitor and Commercial Services Manager will be responsible for ensuring that all our visitors have a great day out, in a safe and secure environment, as well as being responsible for ensuring commercial targets are achieved. The successful candidate will initially establish the operating standards and procedures necessary to open Moat Brae and make it a key attraction for local people and national and international visitors alike, ensuring its future sustainability. On a day-to-day basis, the postholder will oversee the smooth running of the front-of-house operations, guaranteeing that procedures and protocols are adhered to. These include: managing the shop, liaising with the café / catering operator, leading on the development of the visitor bookings, arrival and admissions experience, helping to promote awareness and take-up of venue hire, and overseeing other commercial operations, working with the rest of the management team as appropriate to ensure customer satisfaction. First interviews for the post will be on 28 or 29 August at the Trust’s offices in Dumfries. New research from the Authors’ Licensing and Collecting Service (ALCS) finds working writers’ earnings continue to decline sharply and exposes growing gender gap. 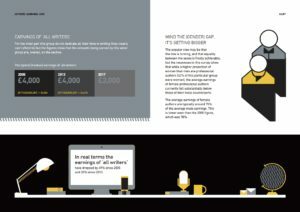 The earnings of writers in the UK continue to fall, new research commissioned by ALCS reveals. The median earnings of professional writers – that is those who dedicate over half their working hours to writing – has fallen by 42% in real terms since 2005 and by 15% since 2013. 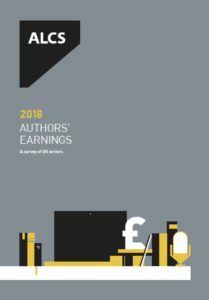 The ALCS research, Authors’ Earnings 2018: A survey of UK writers, found that the median annual income of a professional writer now stands at under £10,500. In 2017 the Joseph Rowntree Foundation’s Minimum Income Standard (MIS), the income level considered to be a socially acceptable standard of living for a single person, was £17,900. The current minimum wage in the UK for those over 25 is £7.83. Based on a standard 35-hour week, the median hourly earnings of a professional writer are just £5.73. At £3,000 a year, the typical median earnings of “all writers” – which includes occasional and part-time writers in addition to professional writers as defined above – are also declining steeply, falling in real terms by 49% since 2005 and 33% since 2013. In 2005, 40% of professional writers earned their income solely from writing. In 2017, that figure had fallen to 13.7%. This reflects the fact that due to their declining earnings, the majority of professional writers now need to have “portfolio” careers, supplementing their writing income with other activities such as teaching. Whilst the incomes of all writers continue to fall, the creative industries in the UK – now valued at £92 billion – are growing at twice the rate of the UK economy as a whole, calling urgently into question the extent to which writers’ significant contribution to those industries is properly valued. Troublingly, the latest ALCS research has also revealed a growing gender gap, with the average earnings of female professional authors only around 75% of those of the average male professional writer down from 78% in 2005. Over 5,500 writers working in a wide range of fields responded to the ALCS survey which was carried out by CREATe; that is more than double the number of respondents who participated in ALCS’s previous research into author earnings in 2013, and a higher number than the combined total of those who participated in 2005 and 2013. More detailed findings from the research will be published later in 2018. “The results of this third ALCS survey into author earnings confirm what most writers know only too well – that incomes continue to decline, and that it is harder than ever to make a living as a professional writer. Given the enormous contribution that the work of UK writers makes to the success of our world-leading creative industries, the ALCS research calls starkly into question the extent to which we value that work. Without writers, our country and our culture would be poorer in every imaginable way and so we must ensure that we give writers as favourable an environment in which to make a living as possible”. Information reproduced from the ALCS press release. 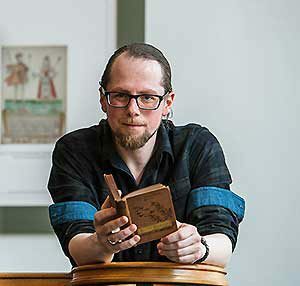 Dr Michael Dempster has been named as the successful Scots Scriever and begins his two-year residency at the National Library of Scotland on 27 June 2018. Dr Michael Dempster. From NLS website. Growing up speaking Scots at home, Dr Dempster has made the Scots language a prominent feature of his academic and artistic work. He has written librettos and graphic novels in Scots, explored the use of Scots with sufferers of dementia within the NHS, and worked with schools and community groups to tackle stigma and prejudice surrounding the Scots language. A prominent linguist, Dempster undertook a Psychology PhD at Glasgow University, researching the processing of rhythmical signals critical to language and music. Dempster has coached film industry professionals in use of the language, produced award-winning podcasts, written comedy sketches performed across the Edinburgh Fringe and TV pilots for the BBC and Comedy Unit and delivered the first ever TED talk in Scots. Upcoming works include a Scots-Emoji dictionary and ‘Mind yer Language’ — a comprehensive guide to Scots. He said: ‘A’m that delichtit tae get appyntit Scots Scriever. Whit an honour! ‘Oor Scots language, an wir Scots speakin communitie, is that important tae baith wirsels an tae the warld thit fir me tae hae this opportunitie tae expand ma wirk wi the support o the National Library of Scotland, Creative Scotland an the Scottish Buik Trust is a dream come true. ‘We are delighted to be able to appoint a new Scots Scriever during what is an exciting time for Scots. With more than 1.5 million people identifying as Scots speakers via the most recent census, with the upcoming UN Year of Indigenous Languages in 2019 and with development work in Scots gaining traction around the country, we are confident the Scriever will play an active and prominent role in this upcoming period of development. ‘The appointment of Michael Dempster to the role I believe will give us the best possible chance of taking advantage of these unique circumstances. He has a vision for Scots which stretches across different parts of society, is contemporary and dynamic and is rooted in his own artistic and academic practice. Dr Michael Dempster’s appointment will run from July 2018–2020, which spans the UN Year of Indigenous Languages in 2019. A joint initiative between the National Library and Creative Scotland, the Scriever role is designed to produce original creative work in Scots, its variants and dialects, across any art-form, as well as raising awareness, appreciation and use of Scots across the country and amongst all parts of the population. Hamish MacDonald was appointed as the inaugural Scots Scriever in August 2015 and completed his residency at the National Library of Scotland in September 2017. MacDonald developed the ‘Wee Windaes’ website which captures the breadth and variety of Scots, in all its variants and dialects, from its beginnings to the present day. Reproduced from the NLS media release. 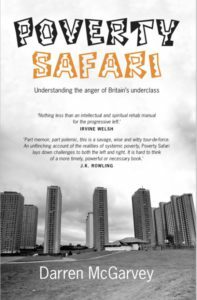 Congratulations to Darren McGarvey, better known as rapper Loki, who is this year’s winner of The Orwell Prize for Books for Poverty Safari: Understanding the Anger of Britain’s Underclass (Luath Press). The judges for The Orwell Prize for Books are politician, academic and journalist Andrew Adonis (Chair), Literary Journalist and Artistic Director of Words and Literature of the Bath Festival Alex Clark, novelist Kit de Waal, and Deputy Life & Arts Editor for the Financial Times Lorien Kite. The Orwell Prize rewards the writing that comes closest to achieving English writer George Orwell’s ambition to ‘make political writing into an art’. This year’s winners each focus on modern Britain, revealing a ‘turn to the nation’ in political writing in the continued wake of the EU Referendum result. Each year prizes are awarded for political writing in Books, Journalism and the Prize for Exposing Britain’s Social Evils, sponsored and supported by the Joseph Rowntree Foundation. Each £3,000 prize was presented by Richard Blair, George Orwell’s son and is determined by a separate panel of independent judges. The Orwell Foundation, based at University College London, home of the Orwell Archive, is sponsored and supported by Political Quarterly, the Joseph Rowntree Foundation and Richard Blair. The winners were announced on Mon 25 June 2019 at a prizegiving ceremony at the Royal Society for the encouragement of Arts, Manufactures and Commerce. Creative Scotland must urgently address its strategic failings following a catalogue of criticism from Scotland’s creative sector, says Holyrood’s Culture, Tourism, Europe and External Relations Committee. The cross-party committee of MSPs say the organisation’s decision-making process on funding for touring theatre and dance companies fell “well below the standard expected” of a non-departmental public body. In a 12 page letter to the Chief Executive Officer of Creative Scotland, the committee sets out the findings from its parliamentary inquiry into Regular Funding for 2018-21. Committee Convener Joan McAlpine MSP said: “We received unprecedented levels of representations from within the sector following Creative Scotland’s handling of regular funding for 2018-21. “With more than 50 responses from artists and arts organisations, it is clear to us that the confidence of a significant element of the cultural sector in Creative Scotland’s regular funding process has been badly damaged. Joan McAlpine’s letter to Janet Archer, Chief Executive Officer of Creative Scotland, will be available on the Committee’s inquiry page. The Committee considers it is a serious matter that Creative Scotland’s evidence about whether the Board was aware of factual inaccuracies contained in assessment reports before its emergency meeting on 2 February has been challenged by the written evidence received. The Committee invites Creative Scotland to review this issue urgently and to report back on its findings. The Committee is disappointed that the strategic issues identified by Creative Scotland were not recognised at an earlier stage so that they could be addressed before applications for regular funding were opened. The failure to do so left the sector in a very challenging position and has ultimately had an impact on a significant element of the cultural sector’s confidence in the regular funding process. . These issues must be urgently addressed by Creative Scotland so that a revised strategy is in place before applications for the next round of regular funding are opened. The Committee intends to scrutinise Creative Scotland’s plans for a refreshed strategy. The Committee considers Creative Scotland’s handling of the regular funding decision-making process in relation to touring theatre and dance companies fell well below the standard that is expected from a non-departmental public body. Creative Scotland should have made a decision about touring companies’ eligibility for regular funding before applications were opened and communicated its decision clearly to the sector. The failure to do so has meant that artists and organisations have committed staff and financial resources unnecessarily to complete regular funding applications. This approach has hampered the sector’s trust in Creative Scotland and added to ongoing uncertainty for the sector at a time when the funding pressures on the sector are already high. The cultural sector is concerned that too much regular funding is being directed away from artists towards network organisations. The Committee therefore invites Creative Scotland to consider an alternative model for the funding of network organisations going forward. The above press release has been reproduced from the Scottish Parliament’s News & Media Centre here. Edinburgh Festival of Cycling is back again for another year celebrating sports, arts, and culture, this time connecting the three Scottish UNESCO Creative Cities: Edinburgh, Glasgow, and Dundee, to explore the ways in which cycling can play a part in our creative communities. 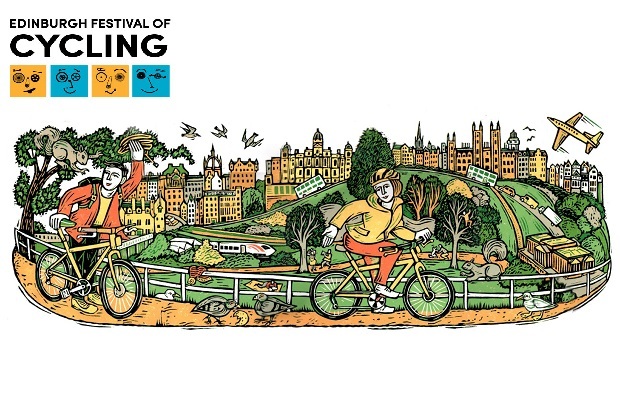 Listed as ‘one of the top 10 cycling festivals in Europe’ by the Active Travellers Magazine, Edinburgh Festival of Cycling takes place this year from 7 to 24 June, with an exciting programme of events taking place across the city and beyond. Edinburgh Festival of Cycling doesn’t just cater to the sports side of cycling, but also explores the many different sides and routes of access to the sport(from transport to competition, from leisure activity to cultural icon) which the festival sets out to celebrate, with a wide range of sporting, cultural and family events for all age groups. This year is also different, as it sees Scotland’s three UNESCO Creative Cities: Edinburgh (City of Literature), Glasgow (City of Music), and Dundee (City of Design), come together for the first time ever in order to celebrate the benefits that arts and culture can have in promoting and enhancing an active live. One of the key features of the programme is a screening in each of the creative cities of the Dutch documentary ‘Why We Cycle’. In this thought-provoking film, ordinary cyclists and specialists talk about why there’s a culture of cycling in the Netherlands and what we can learn from it. The screenings are followed by a discussion which will cover many of the issues raised by Glasgow 2018: how can we make an active life a more ingrained part of our communities? As well as the usual packed programme in Festival’s hometown of Edinburgh, this year there is an increase in literary events, including talks from Peter Walker (author of Bike Nation) and William Manners, who’ll be discussing Revolution: How the Bicycle Reinvented Modern Britain. Working with Edinburgh City of Literature, a writing competition (Writing & Reading) will be held again, encouraging short fiction and poetry about cycling. Thanks to the support of Festival 2018, Edinburgh Festival of Cycling is able to go on tour to these Creative Cities, which share a common narrative of sport – specifically of bikes and how they can change the world. From the stories we tell about them, to the way they work, to the fun we can have on them, the Festival of Cycling programme this year is packed with events for all ages bringing out the best of the UNESCO Creative Cities. Full details of the Art and culture programme of the festival can be found here. The Edinburgh Festival of Cycling Ltd. is a not-for-profit social enterprise, run by a small group of people. The current board of directors are: Kim Harding (Founder and CEO), Caroline Brown, and Ulli Harding. The Edinburgh Festival of Cycling was originally envisaged as a proper Edinburgh-style festival. A city-wide event, originally held over nine days, showcasing and celebrating all aspects of bicycle culture and the city itself. The Festival was expanded from nine days to ten in 2014, and then 11 days inclusive from 2015 onwards. The UNESCO Creative Cities Network (UCCN) was formed in 2004 to promote cooperation with and among citiesthat have identified creativity as a strategic factor for sustainable urban development. The Creative Cities Network is currently formed by 180 members from 72 countries covering 7 creative fields: Crafts & Folk Art, Design, Film, Gastronomy, Literature, Music and Media Arts. The Cities work together towards a common objective: placing creativity and cultural industries at the heart of their development plans at the local level and cooperating actively at the international level. The UK cities involved in the network are: Dundee, Edinburgh, Glasgow, Dublin, Galway, Bristol, Manchester, Norwich, Nottingham, York, Bradford and Liverpool. The Cross Party Group on Culture is to meet on Tuesday 12 June 2018 from 5.30pm-8pm in the Scottish Parliament. The theme of the meeting will be Transformations: the impact of international working. UPDATE: The videos have now been uploaded to view on the CPG website here. The meeting will include a musical performance from 2017 MG Alba Scots Trad Music Awards ‘Folk Band Of The Year’, Talisk, as well as a reading from internationally renowned novelist, poet and playwright, Kevin MacNeil. There are a few places remaining on the guest list for the event. Please RSVP via Kirstin.MacLeod@creativescotland.com and feel free to share with your networks. Earlier this week, the Border Telegraph reported that Borders Council has started replacing trained school librarians with pupils in the region’s secondary schools. There was outcry from parents, and the library and teaching profession and we sent the following comment to the Chartered Institute of Library and Information Professionals in Scotland (CILIPS). “Trained school librarians are an essential part of a modern school, making a positive impact on education by improving literacy in all subjects and helping to raise attainment across the curriculum. They transform the school library into a place of learning and, importantly, they help direct pupils with their own learning, research, and reading, which brings with it important health benefits. CILIP in Scotland has written an open letter to the Chief Executive of Borders Council and reproduced some of the statements they received in reaction to the Borders Council proposal on their website, which you can read here. We will keep you informed of the response from Borders Council. LAS welcomes three new Trustees to strengthen our expertise in education, Scots and strategic leadership, and to broaden our geographic representation, at executive level. Chair of LAS Peggy Hughes said: “We’re delighted to have had great interest from the sector in joining our Board for the two positions advertised. From such strong candidates we have appointed three Trustees to broaden the Board’s voices and perspectives and we look forward to welcoming Valentina, Sophie and David at our next meeting in May. Blood Bath Litzine is open for submissions of short fiction and poetry on the theme of bodies. Bodies are sites of terror and desire; they can be politicised, policed and possessed, becoming either a haven of pleasure or a hellish prison of flesh. They want to read your weirdest, most innovative stories on bodies. They’re open to any and all types of horror, dark fantasy, speculative or science fiction – so don’t hold back. Blood Bath accepts short fiction from 100 to 2,500 words, flash fiction shorter than this as well as poetry (maximum 15 lines) are also encouraged and welcome. A maximum of four poems and two prose pieces at a time. Contributors will be paid, at a rate of £10 per 1,000 words for prose, and £10 per poem. The deadline is 1 August 2018. For more guidelines and information, see the website here. After two years in hiatus, Stewed Rhubarb has made the decision to start work again as a specialist in the publication of poetry by spoken word artists, and is set to re-issue two poetry collections previously taken out of print following the collapse of Freight Books late last year. Tonguit by Harry Giles – a collection shortlisted for both the Edwin Morgan Award and the Forward Prize for First Collection – and The First Blast to Awaken Women Degenerate by Rachel McCrum – former BBC Scotland Poet in Residence – will find a new home with the press, and will both be available in bookshops come April. The new edition of Tonguit is currently available to order from bookshops and online, and McCrum’s The First Blast to Awaken Women Degenerate will be released in May. Stewed Rhubarb was founded in 2013, winning the Callum Macdonald Award for its first pamphlet, The Glassblower Dances by Rachel McCrum. Since then, the imprint has published 16 pamphlets from writers ranging from Edinburgh to the Appalachian Mountains, including playwright Jo Clifford, Scottish spoken-word luminary Jenny Lindsay, and Freight author Russell Jones. Stewed Rhubarb is known for its wildly diverse list, authentic appreciation of the spoken-word scene, and high production values. The online launch for both collections will take place on Wed 25th April. Shortlisted for the Forward Prize’s 2016 debut collection award, Harry Giles’ Tonguit is a moving exploration of identity in Scots, English, and bureaucracy. Politically radical and formally inventive, Tonguit plays at the borders of nationality and sexuality with irreverent affection, questing through languages for a place to speak. Rachel McCrum was born in 1982 and grew up in Donaghadee, Northern Ireland. She lived in Edinburgh, Scotland from 2010 to 2016, where she previously published two pamphlets with Stewed Rhubarb Press: The Glassblower Dances (2012, winner of the Callum MacDonald Award) and Do Not Alight Here Again (2015, also a solo Fringe show). She was the Broad of cult spoken word cabaret Rally & Broad, the inaugural BBC Scotland Poet-In-Residence, and a recipient of an RLS Fellowship in 2016. She has performed and taught across the UK, Ireland, Greece, South Africa, Haiti and Canada. She currently lives in Montreal, Quebec, where she is Director of Les Cabarets Batards. The First Blast to Awaken Women Degenerate is both lyrical and gentle, demanding and sharp as it carves its own path through themes of family, place, environment, and repression. The poems in the collection are fragments of McCrum’s sea-bourne journey from Northern Island, across Scotland, and alighting in Canada. It’s a collection about leaving home and what you take with you. As well as running Stewed Rhubarb, James T. Harding is the editor of C&B News and the features editor of Broadway Baby. He is a writer on Cops and Monsters, a supernatural police thriller on Amazon Prime. He occasionally sleeps. Last month £1,034,174 of Creative Scotland Open Project Funding was awarded to 43 recipients, including individual artists, musicians, writers, theatre makers, festivals and organisations working across the arts, screen and creative industries. Over £950,000 of these awards has been awarded through National Lottery Funding. Dingwall-based Sandstone Press have received funding to enable them to publish twenty-five new titles in 2018, including 10 fiction and 15 non-fiction titles, alongside professional development for members of the Sandstone Press. Novelist Kate Tregaskis, writer Simon Wilson Hall and poet Jim Carruth have all received funding towards new works. New writing publication Gutter Magazine has received funding to support its next four issues. Sir Gerald Eliot, the former chairman of Christian Salvesen and patron of the arts in Scotland, died on 28 January 2018 aged 94. New Lobbying Act – have you registered? The Lobbying (Scotland) Act 2016 is in force from 12 March 2018. The Lobbying (Scotland) Act 2016 became law in April 2016. The Act aims to increase public transparency about lobbying. It defines particular types of communication as ‘regulated lobbying’. From 12 March 2018 the Lobbying Register website (www.lobbying.scot) must be used by anyone who engages in regulated lobbying to record details of their activities. The Register is also searchable by anyone with an interest in finding out about regulated lobbying activity that has taken place. Regulated lobbying is lobbying which takes place face-to-face with MSPs, members of the Scottish Government (including the Scottish Law Officers), Special Advisers or Permanent Secretary and which relates to Scottish Government or Parliamentary functions. There are a number of exemptions in the Act that may mean you will not need to enter details in the Lobbying Register. See this guidance on the Act to help you to determine whether it applies to you. 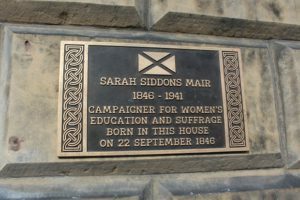 In 2016 the City of Literature Trust nominated Dame Sarah Siddons Mair to receive a plaque as part of the Commemorative Plaque Scheme run by Historic Environment Scotland. 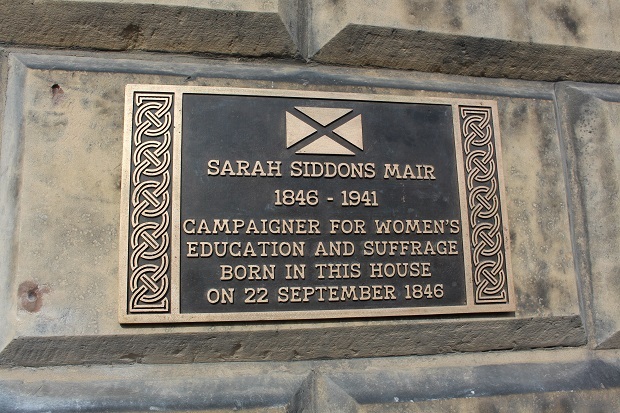 Today, on International Women’s Day, her plaque was installed at 29 Abercromby Place, where she was born, to commemorate her life and work towards promoting women’s education and suffrage. Born in 1846, Mair was the great-great granddaughter of the actress Sarah Siddons, who was best known for her portrayal of Shakespeare’s Lady Macbeth. Sarah Siddons Mair carved a name of her own, however, as one of the most central figures in the Scottish women’s movement. She was a lifetime advocate for women’s education and suffrage, known for her work as a writer, reviewer, editor, and campaigner. At the young age of 19, she was the founder and president of the Ladies’ Edinburgh Debating Society, which offered Edinburgh women the chance to practice speaking in public, acquire debating skills, whilst also exploring social issues. She would later go on to help found the Edinburgh Association for the University Education of Women, and become president of the Edinburgh National Society for Women’s Suffrage in 1907. Mair is also known for her work in promoting higher education for women, and notoriously founded St George’s High School for Girls in 1888. We were lucky enough to be joined by current pupils and teachers from the school, who read extracts from her work, as well as the Royal Scots Club, who organised a lunch in her honour. The unveiling of Mair’s plaque in the New Town came about as a result of the Commemorative Plaque scheme run by Historic Environment Scotland. The Trust nominated three female writers deserving of such commemorations in back in 2016; all of whom were chosen. The other recipients included Dorothy Emily Stevenson, an avid novelist, and Susan Ferrier, widely recognized as ‘the Scottish Jane Austen’. Last year, two further nominated female writers were also chosen to receive plaques: Mary Brunton and Christian Isobel Johnstone. This year, we look forward to the installation of a further two plaques commemorating the lives of Mary Brunton and Christian Isobel Johnstone. For more information about both women, explore the Women Writers’ page on the Edinburgh City of Literature website. Last month £836,779 of National Lottery funding through Creative Scotland’s Open Project Fund was awarded to 41 recipients, including individual artists, musicians, writers, theatre makers, festivals and organisations working across the arts, screen and creative industries. 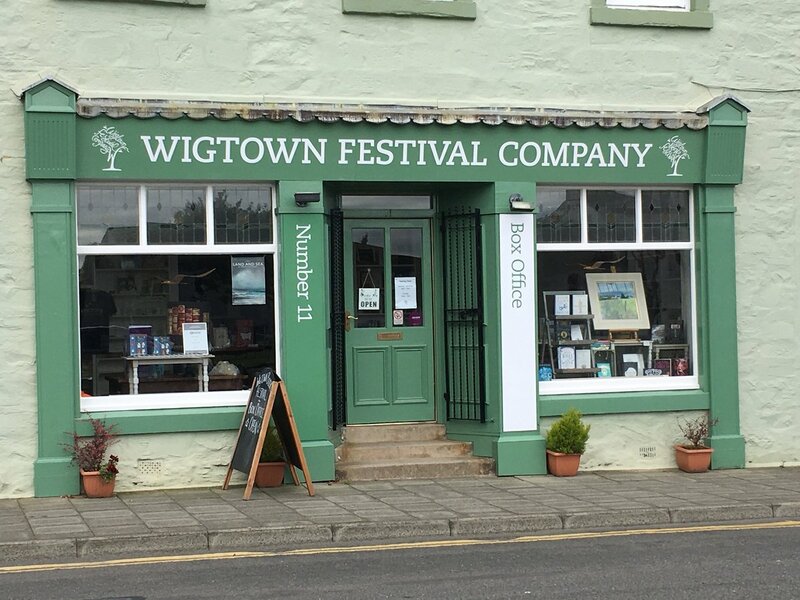 Wigtown Festival Company (WFC) is looking to recruit a cultural producer / programme manager from April 2018. This is an exciting opportunity to be a key member of a team delivering a variety of literary and cultural activities across south-west Scotland, including the annual Wigtown Book Festival. The position is full-time with a salary of £25,000 and is based at our offices in Wigtown, Dumfries & Galloway. The successful applicant will have a strong professional background in arts and literature and proven experience of delivering cultural projects, including monitoring, evaluation and reporting. A driver’s license is also required. This is not an entry level position, though applicants with appropriate internship experience will be considered. WFC is a charitable company limited by guarantee. Our organisation is committed to equalities, diversity and inclusion. To register interest and for further information, including job description and application requirements, please contact Anne Barclay (anne@wigtownbookfestival.com). Application deadline: 5pm, Friday 9 March 2018. Charity registered in Scotland. Number SC037984. The second iteration of the National Library of Scotland’s Gaelic Language Plan is now out for public consultation. The plan will remain open for this period of consultation from 19 January 2018 to 16 March 2018. The Library is seeking the views and comments of interested individuals, businesses and local and national Gaelic organisations, regarding the content of its Draft Gaelic Language Plan which, once finalised, will cover the period 2018-2023. All views and comments will be fully considered before the final draft of the plan is produced at the end of the eight-week period. If you have any comments or queries regarding the content of the plan, please do send an email to GaelicLanguagePlan@nls.uk. Thathar a’ dèanamh co-chomhairle phoblach air an dàrna tionndadh den Phlana Ghàidhlig aig Leabharlann Nàiseanta na h-Alba aig an àm seo. Bidh a’ cho-chomhairle fosgailte eadar 19 Faoilleach 2018 agus 16 Màrt 2018. Tha an Leabharlann a’ sireadh bheachdan bho dhaoine agus buidhnean aig a bheil ùidh sa chùis, a’ gabhail a-steach buidhnean Gàidhlig aig an ìre ionadail is nàiseanta, air an dreachd Phlana Ghàidhlig aige airson 2018-2023. Thèid cnuasachadh air na beachdan uile a gheibhear sa cho-chomhairle mus tèid an dreachd mu dheireadh den phlana fhoillseachadh aig deireadh nan ochd seachdainean co-chomhairleachaidh. Ma tha beachd no ceist sam bith agad mu shusbaint a’ phlana, cuir post-d gu GaelicLanguagePlan@nls.uk. Edinburgh has an amazingly rich literary heritage and was the first city in the world to receive UNESCO City of Literature status. Now, the University of Edinburgh has created a unique four-week course to examine some of Edinburgh’s most celebrated literary talents – Edinburgh: City of Literature. Alongside works by Robert Burns, Robert Louis Stevenson, Ian Rankin, Muriel Spark and Irvine Welsh, the course will explore these writers’ presence in the city through manuscript collections and objects in the National Libraries and Museums of Scotland and the Edinburgh Writers’ Museum. It will also follow their footsteps through the city to see how their presence has been marked with monuments, plaques and other forms of cultural heritage, and consider how these writers represent the city in their works and how it has shaped their writing. Application deadline: 30 March 2018. The course runs from 4-29 June 2018. Watch the video below. For full details visit the website.